This system is used for imaging cortical brain activity with Near-Infrared Spectroscopy. In ECR, we are interested in understanding the human body activity to generate the fine manipulations for highly skill requiring and professional tasks, typical in minimally invasive surgery operations in medicine and manual welding in industrial manufacturing. 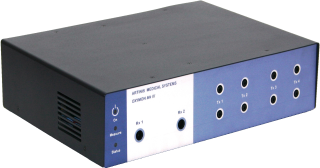 The OxyMon NIRS system enables us to record and analyse the brain activity of novice versus professional subjects and that of trainee subjects throughout the course of training. These analyses helps us to understand the neurological correlates of skilled manipulation. Such knowledge can be used to develop robotic trainers to ease and speed up the training process of novice subjects and to develop robotic assistants to help novice people to perform as good as the professionals.